Here is a nice script for backup your mysql-database. 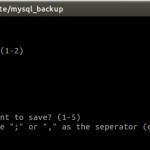 With this simple linux mysql backup script you can do your easy mysql backup by menu-driven user inputs. a backup user with backup-privileges. with this simpl script you have 2 options. 2.) You can choose one or more databases to backup. before the backup mysql will start, the script show you the command that will be execute (see next screenshot). You can use this as a template for sheduling a automatic backup in the crontab. The MYSQLUSER and the MYSQLPW Parameter are equal to the user / password we created at the beginning. If you already have an user in your database or you want to use the root user (not recommended) you can set the data here. The DATABASE_BACKUP_DIR is the default backup directory for the database. You can change the path in the script but you also can change it during the backup-process. DATABASE_BACKUP_FILE is the filename for the backupfile which contains the current date and time. Feel free to change it, if you want ;). Attention: The author does not assume liability for errors or data loss!